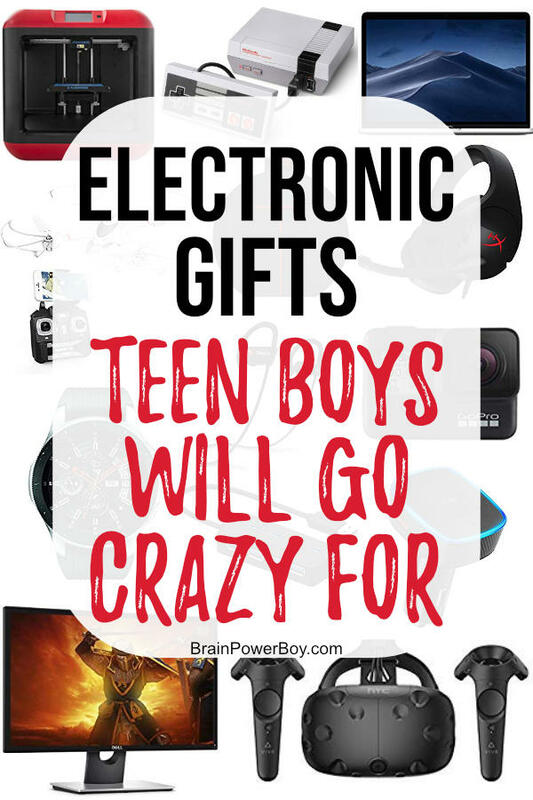 Electronic Gifts for Teen Boys - They Will Go Crazy For These! You know guys love their electronics! If you are wondering what to get them take a look at our incredible electronic gifts for teen boys. I love to find gifts that make the person getting them go WOW! This list has that wow factor for sure. There is nothing like finding the perfect item that your boy is going to get super excited about when he sees it. I’ve been stuck a few times when shopping for an older boy and have dove into finding out what they really want. This is that list. Honestly, they are going to go crazy for these ideas. You are not going to go wrong getting them anything in here. Ready to see the very best ideas? Here we go . . .
Let’s start of with the obvious but very important to them computer gear ideas. If your boy is a creative, or loves Apple products, this is just the laptop for him. We have PCs but I have to say that not one person I know who has switched to a Mac or uses one has ever gone back to a PC and almost all the teen boys I know are big fans of everything Apple makes. If he will be doing a lot of gaming, as well as other work on the computer, then try this Amazon’s choice tower by Alienware, and this monitor with a surprisingly low price, but high ratings instead. This keyboard is so cool! Seriously. I was super impressed when we got it. It not only has RGB lighting which makes it look awesome, it is an amazing piece of equipment. I have only ever had a cheapy keyboard that came with my computer but this is really something special. You can go read about the features through the link. It has an aluminum case! If your boy likes gaming, he will love this. Here is the gaming mouse that goes well with the keyboard. It is also RGB and has different side pieces so you can fit it to your hand and style of play. It will up his game for sure. No boy is going to complain about getting Bose speakers. These are the multimedia set made especially for computers and have very high quality sound. Go check out the reviews and see what you think. If Bose is a bit too high end for your wallet, although they really are not as expensive as I expected, then I would go with Logitech. They are highly rated as well and less money. I have the Z200 pair on my computer. Everyone in my house was impressed with the sound. Even if they have a laptop with a camera they need this. Laptop cameras pale in comparison. This dream webcam can do everything! It delivers pro video results, it has a glass lens, lets you stream, allows for background replacement and includes a 6 month XSplit subscription (which they can use or not.) And best of all it is a great value. You can never have enough storage and you sure don’t want them to lose that report they have been working on or the pictures they took on their last trip! This portable external SSD drive is exactly what they will love to see wrapped up in a nice package. It is fast, rugged, water, dust and shock resistant, plus it has a slick look and an easy to grab, or hook on your pack, hole in the top. Small and Awesome! With all the devices your teen boys have they are likely to need some extra USB ports. This top rated unit is both inexpensive and highly rated. Features 4 USB 3.0 ports for an up-to-date and speedy option. It is also backwards compatible. There are 7 and 10 port units as well which are available through the same link. No more deciding which thing they have to do without when they can plug every single thing in, no problem. If he is into retro, you have an easy choice. 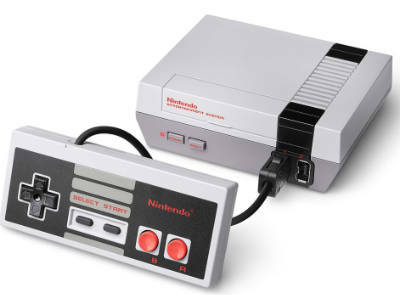 Snap up a NES Classic for the win. p.s. You can play with him! There are some great old games on this unit like Super Mario Bros., Donkey Kong, The Legend of Zelda, PAC-MAN and many more. Remember those?! For headphones, I can’t recommend this pair enough. They have awesome sound, are comfortable, have a clean and crisp mic and are better than many we have tried that were a lot more expensive. They work with PS4 and most PCs. I really love that they have cushioning at the top of the head that is actually fabric instead of a hard foam. For headphones that go with the XBox One, we would choose this pair because of the ratings across the Internet, how they feel very comfortable on the ears (they were in the running and we tried them on before finally deciding on the blue ones above) and include a steel slider for durability. Before my son got into gaming, I never knew there was such a thing as hard surface gaming mouse pad. This one has it all including lights, RGB, USB pass through, and more. It is a high end pad at a medium level price. It will help them have more precision on mouse movements that are critical in games. For the newest and most sought after trend in video gaming we have to go to virtual reality headsets. They are a hot gift right now and I expect they will be for some time to come. After a lot of research, I have chosen the two that I think are the best. You would not go wrong with either choice. The white VR headset is a stand-alone option. No PC, phone or anything else is required to use it. That makes it really awesome if you want to get your boy a VR unit but don’t know all the specs of his computer. They say this one is “designed to amaze” and I agree. It is amazing. Go watch the video and check out the page to see what you think! The black VR headset shown above is top rated by many sources. You will need to make sure that your teen’s computer rig has the proper specs in order to use this one. You can see what is needed on Amazon. There are over 2800 titles available for this headset and that gives gamers a lot of choices! I wasn’t sure if I should include smart phones in this guide. On the one hand, you can’t really have a solid electronics gift guide for teen boys without them. On the other hand, phones are so personal and many get their phones through their carriers. However, since it is usually a much better deal to just buy the phone outright and not be locked into a contract, so I did consider that as well. So . . . here are the phones that will make your boy happy and one that will make your wallet happy too! Grabbing the latest and greatest phones is sure to WOW them. Whether they are Android fans or Apple fans, one of these top-of-the-line and oh-so-slick smart phones are sure to please. In fact, they will probably go nuts if they are not expecting it! It is so fun to surprise them. If you are on a budget, and want something a bit lighter on your wallet, try this one. It has enough features to keep them happy – gorilla glass, dual rear cameras, HD screen, 4G LTE, long battery life and turbo charge. Overall a great phone for the price. We have a DSLR (and love it!) but . . . only get one if it makes sense for your boy. The cameras on phones are great, but they are not as good as an excellent DSLR. I would get this for a guy who was interested in taking high-end pictures, will end up using it often, or really loves photography and/or videography. This is the DSLR we own and I highly recommend it. The kit we got is awesome for YouTube, social media, creating movies. or any video they would need to shoot and the pictures it takes are incredible. A nice choice for many boys will be a compact camera that they can take with them as they go about life, travel, and move about in their world. The camera pictured above (nice looking camera, right?!) is a great choice and is more portable and much less expensive than a DSLR. It takes amazing pictures. These are just right for active guys who love to jump on bikes, skateboards, motorbikes, boats, skis etc and want to shoot some cool footage while doing so. They help with training, are great for sharing footage on social, and are simply a whole lot of fun to use. I took a look at all of the GoPro options and I suggest if that is the brand you want to go with, you either get the GoPro Hero7 which is the latest version and has live streaming stabilization or, the more affordable GoPro 5 which is still a great choice. Skip the Fusion unless he is specifically asking for that as the reviews are not great. If you are looking for a more affordable camera option try this. It is not a GoPro but the reviews are pretty awesome and it is still waterproof. Since your teen boys may range from age 13 – 19, you will need to know if your boy will like these options. I picked the more grown-up toys and do remember that even though they are growing up they still like to have fun! Let’s start with a Star Wars idea. This robot is a winner for sure. The app-enabled robot with trainer feature allows it to be programmed. That is what I think makes this a great choice. Plus, as a bonus, it makes sounds when you watch the movies with it. Fun! I had to do some extra research to find a good RC car. We have some but . . . while they are pretty good, older boys wouldn’t be impressed. These are the best ones you can get for a decent price. They are not your 25.00 cheap remote control cars, but believe me, that is not what they are going to want anyway. These rock! See my top choice which is pictured above or a bigger selection. Another totally great remote control item to consider is a drone. They are really a lot of fun to use and there are some options that are very inexpensive such as this highly rate mini, as well as the ones pictured above that are a whole lot of tech for not a lot of cash. With a fitness tracker one can monitor heart rate, goal based exercises, and sleep depending on the model. The Fitbit is the best tracker brand out there. Even though others are available the reviews speak for themselves. We are talking a few hundred on the other brands, to 17,000 or so for this model. The latest model doesn’t have that many yet because it is new but it has more up-to-date technology so I would certainly put that into the running. If you really want to wow them and they don’t already have a smart watch, one of these ought to do. If they are Apple only guys, then go with the latest Apple Watch. Whereas, if they like Samsung instead, then to with the newest Samsung watch.There is no wrong choice here as long as you stick to the bigger brands. You can also choose an older version to save some money although honestly, I usually get the latest version when we are talking technology because I like it to be the most up-to-date available if I am forking out the money for it. Plus, it is a gift so I also spend more for those than for everyday purchases. I feel these are the best headphones for the price in the over-the-ear category. They are also very nice looking. If he likes earbuds instead, try the ones pictures above.Or, the ones I think are the best deal around and sound great. They are not pictured because Amazon won’t let me show them to you. You will have to click on this link and then scroll down to the Ergo pair that have 55,000+ reviews. If wireless is what he needs then either go with these inexpensive but excellent bluetooth sports earbuds, or the more expensive premier Apple option. If they love to take their music on the go, but also want to share it with friends, then portable speakers are a must. Any of these three will work great. I didn’t pick some of the higher end ones because to be honest, these get beat up a bit when they are out and about and all of these have awesome sound quality so there is no need to pay several hundred dollars. The triangular speaker is the highest rated and has a lot of features. Go read about it. The Anker speaker in the middle has the longest play time. The pod is a speaker that is the most portable as it has a loop at the top which allows you to attach it to a backpack, bike or belt. It is also waterproof. If you have a creative on your hands, I think you will really like these choices. My husband was a professional musician for many, many years and our whole family has creative tendencies. This is likely my favorite section of this gift guide. Let’s start with a couple of musical choices. The drum set pictured is a nice starter set that should let them get a good idea if the drums are their thing. They are super fun to play! If you don’t have room for a full-size electric drum set, or are not sure they are ready for that, why not try a portable tabletop version. As far as keyboards go, even if he isn’t planning to play the piano, I would get one. We got my son one and it is used a lot. He enjoys playing it, learning songs by ear and also messing around with the special keys and voices. It was worth every penny we spent. You can pick up this Yamaha (musician husband recommended) which has a nice sound, is of good quality and is great for beginners. It also comes in a bundle with a stand and a stool in you want a package deal. I couldn’t leave out an electric guitar. Of all the electronics a teen boy may want, many dream of playing the electric guitar.They can do so with this wonderful Fender Squier kit and some YouTube videos or the included Fender Play 3 month subscription. It is a nice beginner package. If you are looking for a step up, try this one instead. I am somewhat torn on what drawing tablet to recommend. Drawing tablets can be limited because that is all they can be used for. The new iPad can be used with the Apple pencil and I think that combo would be awesome. So, I’m sticking with recommending the iPad with the pencil and suggest you buy either Procreate or Affinity Designer to go with it. They are both amazing apps that allow for so much creativity. If you think he would rather have an actual drawing table go here for some affordable choices. Try a 3D pen for a unique and unusual gift idea. The 3Doodler Create+ has a bit of a youngish sounding name but it has a 1 year warranty (some do not have any warranty at all) and is an upgrade from the previous model. Grab this book to go along with it! My last idea in the music and art category of this gift guide for teen boys is . . . a 3D printer. Since they have been out for a while now you can actually get one for your home. The prices have come down a lot since I first saw them years ago. I chose a nice machine for beginners. It is basically plug and play which makes it very easy to get started. You will need to grab some filment as well so don’t forget that. You will want to make sure there is some interest there before purchasing, but if you have a maker on your hands, he will love this. This section has some very cool gadgets that don’t really fit in the other categories. However, I didn’t want to leave them out because I know they will be enjoyed. Tile is a tracking devise that will help him keep track of his things like keys, backpack, wallet, or whatever he wants to keep track of. Some people also clip it to a pet’s collar so they can find them easier. If you have a boy who loses things, this is a great option. Even if he doesn’t, it is a pretty handy idea. Did you know they have bluetooth clothing? Here is a hat that is USB charged and has a bluetooth speaker embedded into it. Cool, right? The Echo Show 2nd Gen is the latest from Amazon and it is pretty slick! Dolby sound, and Alexa are great but you can also watch live TV, and it even includes skills (which I love! )Skills are ways to interact with Alexa and do everything from play Jeopardy, to meditate, to learn something new. It is stacked with possibilities. Oh, and you can also video call on Skype with it – reminds me of the Jetsons! I learned a few things while doing this guide. This is a product that I didn’t know was out there. It is a USB charger for your car, but it can do oh so much more. Go check it out! I’m sure your boy will think it is pretty slick. Last, but not least, is a mini projector. Why would a teen boy want a projector? Let me tell you!They can use it for so many things: movies (indoors or outdoors,) video games, and pictures can be projected from this little gem. It hooks up to a TV Box, Amazon Fire TV Stick, ChromeBook, PC, Laptop, Tablet, Blue-ray DVD player, SD Card, USB Flash Drive, Media players, and phones. I can only imagine the use this will get by him and his friends! I really hope you found and electronic gift to buy for your teen boy! They guys I spoke to would love to get many of these things. Focus on their likes, wants and needs as well as the type of things that they enjoy and you will grab a gift that will wow them! If you need more ideas please check out our Amazing Inexpensive Gifts for Teenage Boys as well for more ideas. These are all under $20.00 and are all unplugged options.